The amphituber family is a family of frog-like amphibians in all of the Pikmin games. Nearly every member has the ability to crush Pikmin, either by floating upwards and slamming down, or by just jumping. 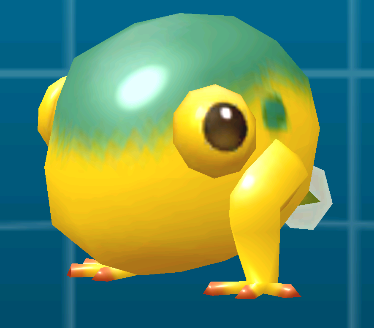 Also similar to frogs, tadpole variants exist, although the only one seen in-game is the tadpole stage of the Yellow Wollywog. Main article: Fiery Young Yellow Wollywog. The Fiery Young Yellow Wollywog is a variation of the Young Yellow Wollywog found in Hey! Pikmin. It has an orange color with dark red markings, and its entire body is lit on fire, meaning it can only be defeated by Red Pikmin. Wogpoles resemble tadpoles, and are in fact the juvenile form of amphitubers. Wogpoles are one of the weakest enemies in the Pikmin series. In the first game, they only appear in the The Forest of Hope and The Distant Spring. They are typically a hard-to-get, low-reward enemy in that they are fast swimmers that run away and only produce one seed when carried to the Onion. In Pikmin 2, they are found in the Awakening Wood and Perplexing Pool areas, as well as being found in the sublevels of some caves. Also, they can occasionally get out of the water. When they do this, they will flop high in the air and their speed is drastically reduced. Wollywogs are a species of mature amphituber that live in the bowels of subterranean areas. They are gray and have red eyes, and are usually found in watery cave-live areas, such as caves in Pikmin 2 and The Forest Navel in Pikmin. They are defeated in the same manner as Yellow Wollywogs, but are more aggressive, and attack with a jump more readily. The lack of skin coloration is due to living in sunlight-free places. Yellow Wollywogs are more slender, taller, yellow versions of Wollywogs that live near bodies of water out in the open like in The Distant Spring or Perplexing Pool as opposed to underground areas, though this is not always true. Like Wollywogs, they try to crush Pikmin by jumping into the air. To defeat them, it is best to approach from behind and throw Pikmin on top, calling them back before the creature falls. Main article: Young Yellow Wollywog. Young Yellow Wollywogs are Yellow Wollywogs in an earlier part of their life cycle, as seen in Hey! Pikmin. It is much smaller, with only one pair of legs, and part of its tail is still attached. It can be defeated by throwing a single Pikmin onto it. The following enemies exist in Pikmin Adventure, and are said in-game to belong to the amphituber family. They are, however, not canon. The Large-Mouth Wollywog is the second boss fought in Pikmin Adventure. It has eyes on stalks, a large mouth (as the name would imply) and can only be attacked at specific parts of its body at specific parts of the fight (i.e. the tongue at the start of the fight, its cheeks at the middle of the fight, and its back at the end of the fight). The Large Mouth Wollywog does not attack by jumping, but rather by extending its spike-ball-tongue at the player. This tongue will do damage whether or not it is the boss's current weak spot. The Translucent Wollywog is the second boss to be fought in the extra challenges of Pikmin Adventure. Its nearly identical to the Large-Mouth Wollywog from the 16 standard challenges. The only differences is that it is see-through, and shoots its tongue out three times in a row instead of just once. Its movement and attacks also have increased in speed, making it much more difficult. When stunned, it becomes white and opaque. Amphituber is a portmanteau of "amphibian", the real world class that frogs are a part of, and "tuber", due to their potato-shaped body. Most members of this family use the name "Wollywog" or some variation. That word is a play on the pollywog, which means tadpole. Because "wog" is an offensive word in the United Kingdom, Wollywogs were renamed to Wollyhops, and the Wogpole to Wolpole, in the European versions of New Play Control! Pikmin, New Play Control! Pikmin 2, and Pikmin 3. "Hop" references these enemies's dangerous jumps. Amphicaris is the genus for members of this family, and likely comes from "amphibian". Animation alternating between the two Wollywogs. In Pikmin, the Wollywog and the Yellow Wollywog share almost exactly the same bottom. Besides a small bit of the belly, front legs and "chin", as well as the Wollywog's "tail", the geometry of the bottom half of the model is exactly the same. This page was last edited on February 17, 2019, at 12:03.